More than 1,000 cats and dogs hot-pawed it back to the UK via the Channel Tunnel on Sunday after trips to the continent, smashing the previous three-day record for the service, according to local reports. Kent Online reported that the Eurotunnel's previous best came on January 3 when the 'Le Shuttle' service carried a total of 926 pets. Shuttles also shattered the record for carrying passenger vehicles during the festive season, with 200,000 taken over the Christmas and New Year period. Records also tumbled for Le Shuttle in terms of traffic over the school holidays. From December 14 to January 6, a total of 200,000 cars, motorbikes, camper vans, buses and other vehicles were taken on the service between Cheriton and Coquelles. This was equivalent to about one million passengers, the highest total since 2001. 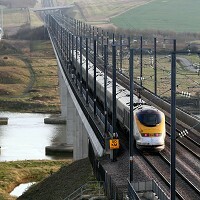 Whether travelling via the Channel Tunnel or by plane, holidaymakers heading to the continent are advised to invest in appropriate travel insurance cover.